Special clinical interests in arrhythmias/electrophysiology . Dr Deepak completed an Honours degree in science (majoring in Anatomy and Exercise Physiology) at Monash University, Melbourne where he was awarded with an anatomy dissection scholarship. He scored in the top 1% of the GAMSAT entrance exam and moved to Brisbane to study medicine at the University of Queensland. He trained in cardiology at The Prince Charles, Royal Brisbane and Women’s and Gold Coast Hospitals. 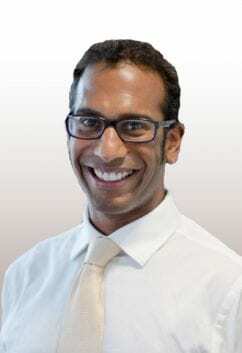 He pursued subspecialty training in cardiac electrophysiology, predominantly device implantation (pacemakers and implantable defibrillators) and cardiac catheter ablation at the Royal Brisbane and Women’s Hospital. He then gained further experience including complex ablation (atrial fibrillation and ventricular tachycardia) over a two year fellowship at one of the largest ablation centres in North America at the Royal Jubilee Hospital, British Columbia, Canada. He has presented research at international conferences in Australia, North America and Europe, most recently published in The Lancet 2012. Dr Deepak’s special interest areas include atrial fibrillation, inherited channelopathies, inherited and acquired cardiomyopathies. He is a keen cyclist and runner and also specialises in sports related arrythmia. Dr Deepak joined HeartCare Partners (now GenesisCare) in 2013 and practices at Mater Private Clinic and The Wesley Hospitals in Brisbane, while also visiting Hervey Bay regularly.